Inflammatory bowel disease (IBD) is an intractable autoimmune disease, relatively common in cats, with chronic vomiting and diarrhea. Previous studies have reported that mesenchymal stem cells (MSCs) alleviate inflammation by modulating immune cells. However, there is a lack of research on cross-talk mechanism between feline adipose tissue-derived mesenchymal stem cells (fAT-MSCs) and immune cells in IBD model. Hence, this study aimed to evaluate the therapeutic effects of fAT-MSC on mice model of colitis and to clarify the therapeutic mechanism of fAT-MSCs. Intraperitoneal infusion of fAT-MSC ameliorated the clinical and histopathologic severity of colitis, including body weight loss, diarrhea, and inflammation in the colon of Dextran sulfate sodium (DSS)-treated mice (C57BL/6). Since regulatory T cells (Tregs) are pivotal in modulating immune responses and maintaining tolerance in colitis, the relation of Tregs with fAT-MSC-secreted factor was investigated in vitro. PGE2 secreted from fAT-MSC was demonstrated to induce elevation of FOXP3 mRNA expression and adjust inflammatory cytokines in Con A-induced feline peripheral blood mononuclear cells (PBMCs). Furthermore, in vivo, FOXP3+ cells of the fAT-MSC group were significantly increased in the inflamed colon, relative to that in the PBS group. Our results suggest that PGE2 secreted from fAT-MSC can reduce inflammation by increasing FOXP3+ Tregs in mice model of colitis. Consequently, these results propose the possibility of administration of fAT-MSC to cats with not only IBD but also other immune-mediated inflammatory diseases. Inflammatory bowel disease (IBD) is the most common intestinal disorder in cats and has been shown to lead to vomiting, chronic diarrhea, and weight loss . Although the exact underlying mechanism remains unknown, possible contributory factors include genetic factors, infectious agents (including bacteria and parasites), allergies (dietary), and immune dysregulation [2, 3]. Treatment of IBD usually involves alteration of the diet and the use of medication, such as immunosuppressants and antibiotics . However, some feline patients do not respond to any of these treatments. With recent advances in veterinary medicine, stem cell-based treatments have begun to be applied for the treatment of animal inflammatory and immune disorders. Accumulating evidence suggests that the therapeutic potential of mesenchymal stem cells (MSCs) may be attributed to their differentiation and integration into the injured site . Additionally, MSCs have the ability to secrete soluble factors, which functionally modulate the microenvironment of the host tissue to facilitate the endogenous process of immunomodulation [6–8]. Several soluble factors secreted by MSCs, including transforming growth factor-β (TGF-β), indoleamine-pyrrole 2,3-dioxygenase (IDO), nitric oxide (NO), and prostaglandin E2 (PGE2), have been proposed to mediate the immunosuppressive effect [9, 10]. Previous studies have demonstrated a prominent role of PGE2 in the immunomodulatory properties of MSCs [11, 12]; they have proven that PGE2 may induce anti-inflammatory activity of MSCs through modulation of regulatory T cells. Although many studies in veterinary medicine have suggested that MSCs have immunomodulatory effects on activated immune cells [13–20], only a few studies in feline medicine have characterized the secretory factors from feline MSCs. Moreover, the crosstalk mechanisms between feline MSCs and immune cells have not been fully elucidated. 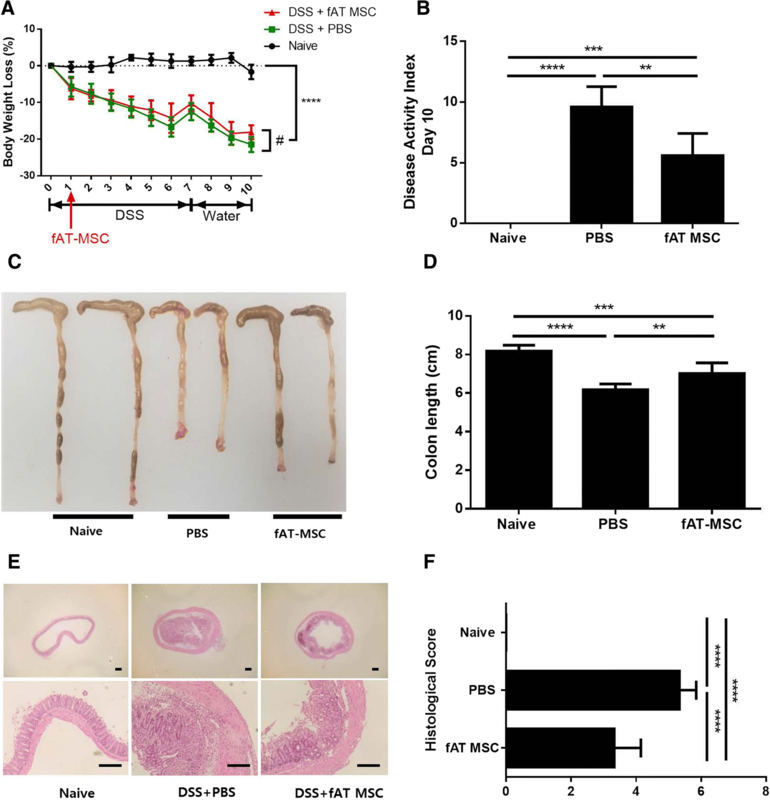 In this study, we examined whether feline adipose tissue-derived mesenchymal stem cells (fAT-MSCs) could alleviate inflammation in colitis in immunocompetent mice induced by dextran sulfate sodium (DSS). Additionally, we analyzed the immunomodulatory mechanisms of PGE2 secreted from fAT-MSCs. Our findings provide important insights into the immunomodulatory abilities of the soluble factors of fAT-MSCs. The cultured cells isolated from feline AT had a fibroblast-like morphology. 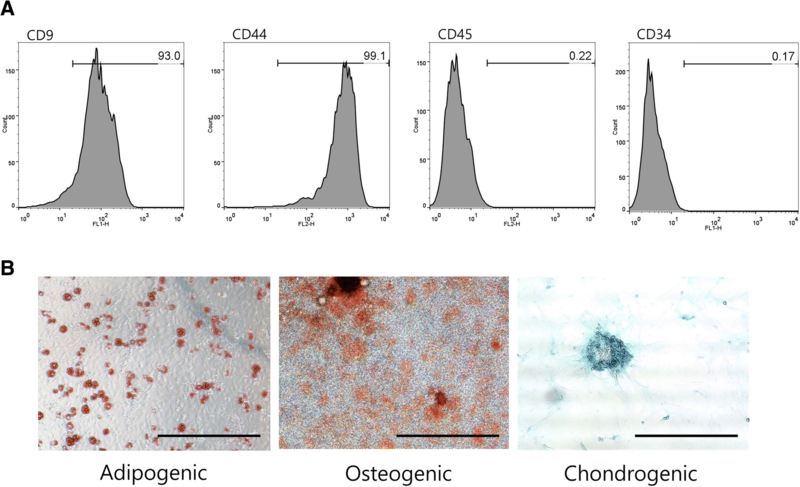 The immune-phenotypes of the cells included high expression of cluster of differentiation (CD) 9 and CD44 and low expression of CD34 and CD45 (Fig. 1a). The fAT-MSCs had multilineage plasticity, as demonstrated by their potential for adipogenic, osteogenic, and chondrogenic differentiation. Adipogenic differentiation was evaluated by Oil Red O staining following 3 weeks of adipogenic induction. Matrix mineralization was evaluated by Alizarin Red S staining of fAT-MSCs following 3 weeks of osteogenic induction. Proteoglycans in cells were revealed by Alcian Blue staining after 3 weeks of chondrogenic induction (Fig. 1b). In this study, we first investigated whether fAT-MSCs exerted an anti-inflammatory effect on mice with DSS-induced colitis. On day 10, mice treated with DSS developed a severe acute illness, characterized by mild to moderate diarrhea, rectal bleeding, and depressed activity, accompanied by continuous weight loss (Fig. 2a, and b), and microscopic examination of the colon of the PBS group showed striking hyperemia, inflammation, necrosis, and shortening (Fig. 2c, and d) as well as histological changes with increased wall thickness, localized inflammatory cell infiltration, and epithelial ulceration (Fig. 2e, and f). However, the mice in the fAT-MSC-injected group showed amelioration of colitis compared with those in the PBS group (Fig. 2a, b, c, d, e, and f). After checking the degree of reduction in body weight for 10 days, there was no significant difference in weight loss between the PBS group and the fAT-MSC group from day 1 to day 9. However, on day 10, mice treated with fAT-MSCs showed a lower weight loss (P = 0.0322 by t -test comparison) than those treated with PBS (Fig. 2a). In addition, fAT-MSC-treated mice had lower clinical disease score (Fig. 2b). Moreover, on day 10, an autopsy was performed for histological evaluation of the colon. The results showed that fAT-MSC-treated mice had longer colon length (Fig. 2c, and d) than PBS-treated mice and showed significantly ameliorated colonic transmural inflammation, decreased wall thickness, reduced mucosal ulceration, and focal loss of crypts, all of which were associated with decreased disease scores and histological scores (Fig. 2e, and f). Because pro-inflammatory cytokines play important roles in the development of DSS-induced colitis, a possible mechanism of fAT-MSC therapy is suppression of the production of these cytokines in the colon. Therefore, we next investigated the effects of fAT-MSCs on the mRNA expression of inflammatory cytokines that are mechanistically linked to colitis in the colon of the same mouse as in the above experiments. The levels of tumor necrosis factor (TNF)-α, interleukin (IL)-1β, interferon (IFN)-γ, and IL-6 were markedly increased after DSS induction. However, the levels of these cytokines in colon tissues from DSS-induced mice that had been infused with fAT-MSCs were significantly lower than those in mice of the PBS group. The results indicated that the infusion of fAT-MSCs had inhibitory effects on the expression of TNF-α, IL-1β, IFN-γ, and IL-6, which are classically associated with DSS-induced colitis, in the colonic tissue. 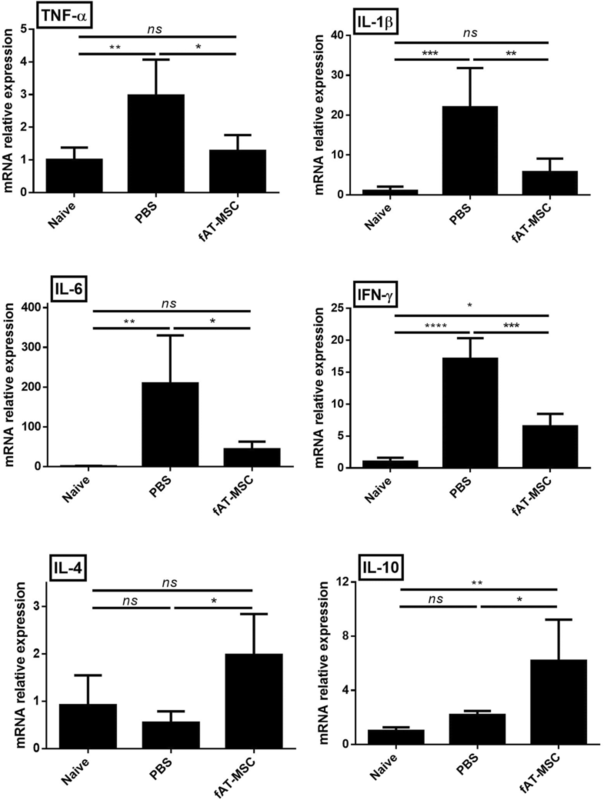 Conversely, the expression of the anti-inflammatory cytokines IL-4 and IL-10 increased in the fAT-MSC group relative to that in the PBS group (Fig. 3). Previous studies have shown that PGE2 secreted from stem cells plays an important role in immune regulation [21, 22]. However, studies on PGE2 secreted by fAT-MSCs are insufficient. Therefore, to further assess the mechanisms underlying the fAT-MSC-dependent downregulation of pro-inflammatory cytokines and upregulation of anti-inflammatory cytokines in inflamed colon tissue, we established a fAT-MSC/feline peripheral blood mononuclear cell (fPBMC) co-culture protocol in vitro. Our findings confirmed that the concentration of PGE2 was increased in the supernatants of the fAT-MSC group cultured with concanavalin A (Con A)-stimulated feline PBMCs but was decreased in the group treated with NS-398, an inhibitor of the PGE2 synthesis-related enzyme, cyclooxygenase (COX)-2 (Fig. 4). To determine whether increased PGE2 was secreted from fAT-MSCs in co-cultured medium, the relative mRNA expression levels of COX-2 in fAT-MSCs and fPBMCs were confirmed by qRT-PCR and agarose gel electrophoresis. The results showed that COX-2 was highly expressed in fAT-MSCs co-cultured with Con A-induced fPBMCs (Additional file 1). 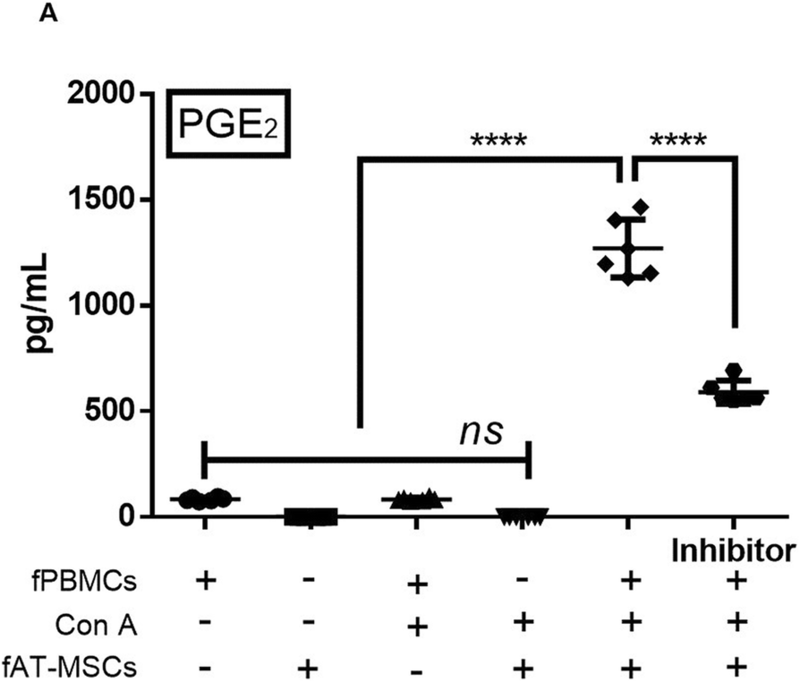 This suggested that PGE2 was secreted from fAT-MSCs rather than fPBMCs. We then evaluated the anti-inflammatory effects of fAT-MSCs; pro- and anti-inflammatory cytokines were measured at the mRNA level in Con A-stimulated feline PBMCs. 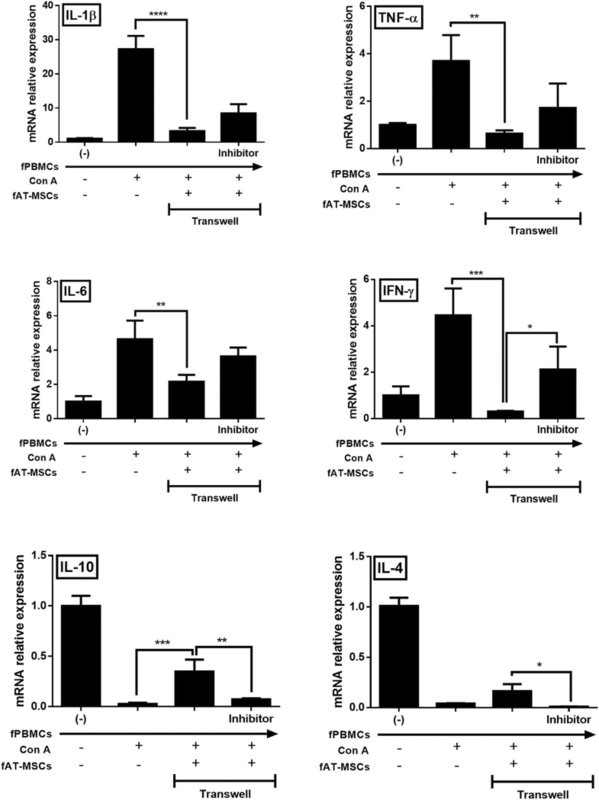 The expression of the pro-inflammatory cytokines, TNF-α, IL-1β, IFN-γ, and IL-6, decreased when Con A-stimulated feline PBMCs were co-cultured with fAT-MSCs. In contrast, the expression of anti-inflammatory cytokines, i.e., IL-4 and IL-10, increased. Next, we examined how the decreased secretion of PGE2 affected the cytokine-modulating effect of fAT-MSCs. Notably, both the pro- and anti-inflammatory cytokine-modulating effects of fAT-MSC were reduced in the NS-398 treatment group (Fig. 5). PGE2 is known to be related to changes in T-cell polarization, and regulatory T cells (Tregs) are known to play important roles in alleviation of colitis [23–25]. Therefore, we determined the changes in T-cell phenotypes in the presence of different PGE2 concentrations. Because FOXP3 is specifically expressed in naturally occurring Tregs, the extent of changes in FOXP3 mRNA expression was confirmed by measuring changes in PGE2 concentrations. The expression of FOXP3 mRNA increased with increasing PGE2 and decreased following treatment with NS-398 (Fig. 6). Immunostaining was performed in the inflamed colon to examine whether the ratio of Tregs was also increased in vivo. CD3 and FOXP3 were stained separately but compared at the same sites in the same colon samples. Quantitative analysis of FOXP3+ and CD3+ cells, detected in colon tissue sections, showed that the extent of the increase was larger in FOXP3+ cells than in CD3+ cells in the fAT-MSC group compared with that in the PBS group (Fig. 7). In this study, we aimed to determine whether administration of fAT-MSCs alleviated intestinal inflammation and whether regulation of inflammatory cytokines associated with colitis occurred through immune cell regulation via secretory factors from fAT-MSCs. Feline stem cells are immune privileged, partly due to the low expression of the major histocompatibility complex class II molecule [26–28]. Therefore, we performed in vivo experiments using immunocompetent mice to confirm that fAT-MSCs had anti-inflammatory effects through immune system control. We showed that intraperitoneal administration of fAT-MSCs in mice with DSS-induced colitis alleviated the disease symptoms such as decreased activity, rectal bleeding, and stool consistency. In addition, the body weights of the mice, measured for 10 days, were not significantly different between the PBS and fAT-MSC groups from day 1 to day 9, but on day 10, the weight reduction in the fAT-MSC group was less than that in the PBS group. Although there was little difference in the weight between the PBS group and the MSC group, the clinical symptoms, colon length, and histological examination showed that the fAT-MSCs alleviated DSS-induced colitis. Recent studies have shown that the expression of inflammatory mediators, such as cytokines, is an important factor in the progression of colitis . In this experiment, we demonstrated that injection of fAT-MSCs reduced the expression of pro-inflammatory cytokines, such as TNF-α, IL-1β, IFN-γ, and IL-6. However, in the fAT-MSCs group, the levels of anti-inflammatory cytokines, such as IL-4 and IL-10, were upregulated in the injured colon. These results indicated a distinct correlation between the immunomodulatory potential of fAT-MSCs and their ability to ameliorate the inflammatory response in IBD. 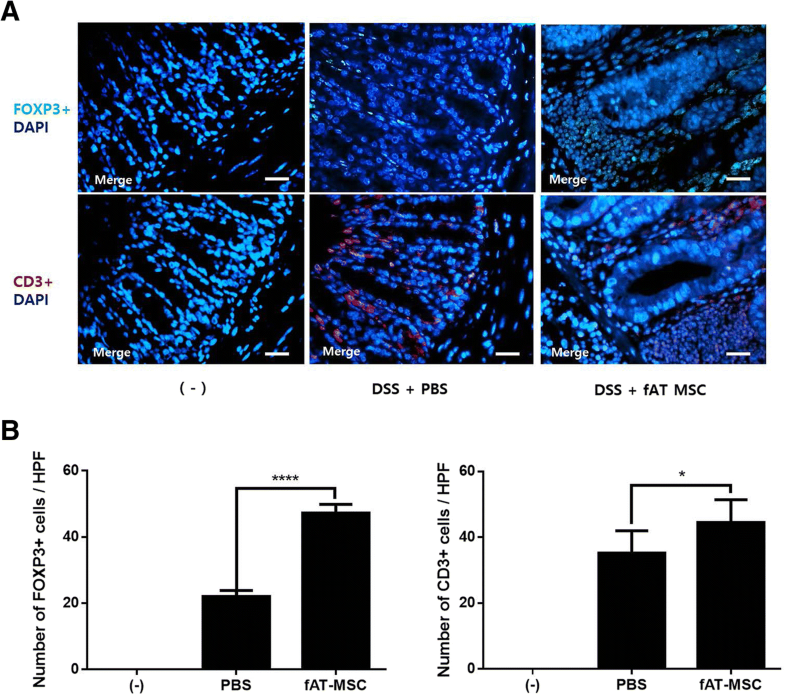 In previous studies, MSCs were found to secrete certain cytokines, such as IDO, TGF-β, NO, and PGE2, among which, PGE2 has been shown to be pivotal for the anti-inflammatory effect of MSCs in several inflammatory disease models, including wound disease, brain disease, arthritis, lung injury, periodontitis, and colitis [30–36]. Such anti-inflammatory effects are mediated through immune regulation; in the intestinal tract, immunomodulation occurs mainly via T cells [37–40]. Therefore, in this study, we hypothesized that PGE2 secreted from fAT-MSCs plays an important role in immune regulation and that reduction of PGE2 secretion from stem cells decreases the immunoregulatory capacity of fAT-MSCs. For this experiment, NS-398 (a selective COX-2 inhibitor; which has not been used in fAT-MSCs but has been used in various cells) [41–43] was used as an inhibitor of PGE2 secretion by fAT-MSCs. To prove this, we directly monitored protein concentration of PGE2 secreted from fAT-MSCs in conditioned medium following co-culture of fPBMCs and fAT-MSCs. The result confirmed that the concentration of PGE2 was high in the medium of Con A stimulated-PBMCs co-cultured with MSCs, and conversely, in the group treated with NS-398, the PGE2 concentration was decreased. In addition, fAT-MSCs co-cultured with fPBMCs stimulated with Con A (a T-cell mitogen activator) showed reduced expression of pro-inflammatory cytokines, such as TNF-α, IL-1β, IL-6 and IFN-γ. However, in the NS-398-treated group, the overall anti-inflammatory effects of fAT-MSCs were decreased, and especially, mRNA expression of IFN-γ was significantly increased in the inhibitor group than in the fAT-MSCs group. In the case of IL-10 and IL-4, known to be anti-inflammatory or immunosuppressive cytokines, Con A -induced fPBMCs showed an increasing tendency when cultured with fAT-MSC. However, the NS-398-treated group showed the opposite tendency. Taken together, fAT-MSCs have cytokine-modulating effects on immune cells, and PGE2 indirectly plays a major role in this regulatory effect. Diverse regulatory mechanisms cooperate to maintain intestinal homeostasis [44, 45], and disruption of these pathways may lead to inappropriate immune responses to intestinal communities [46, 47], thereby contributing to pathogenesis. Several studies have shown that bowel homeostasis is closely related to Treg activation [48–50]. Moreover, colonic Tregs recognize and suppress immune responses against antigens, including commensal bacteria and food [51, 52]. In particular, FOXP3+ Tregs, most of which are CD4+ T cells, are potent mediators of dominant self-tolerance in the periphery and can suppress the activation, proliferation, and effector functions of a wide range of immune cells, including natural killer cells, B cells, antigen-presenting cells, and T cells . In addition, in in vivo and in vitro studies, IL-10 was significantly increased in the fAT-MSCs group when anti-inflammatory cytokines were measured, and many studies have reported that IL-10 is closely related to regulatory T cells [54, 55]. Therefore, understanding the mechanisms responsible for the development of FOXP3+ Tregs in the intestine of patients with IBD could provide new therapeutic options. The mRNA expression levels of FOXP3, a Treg lineage-specification factor [56, 57], were further confirmed in vitro; FOXP3 expression increased in the fAT-MSC group but decreased in the COX-2 inhibitor group. 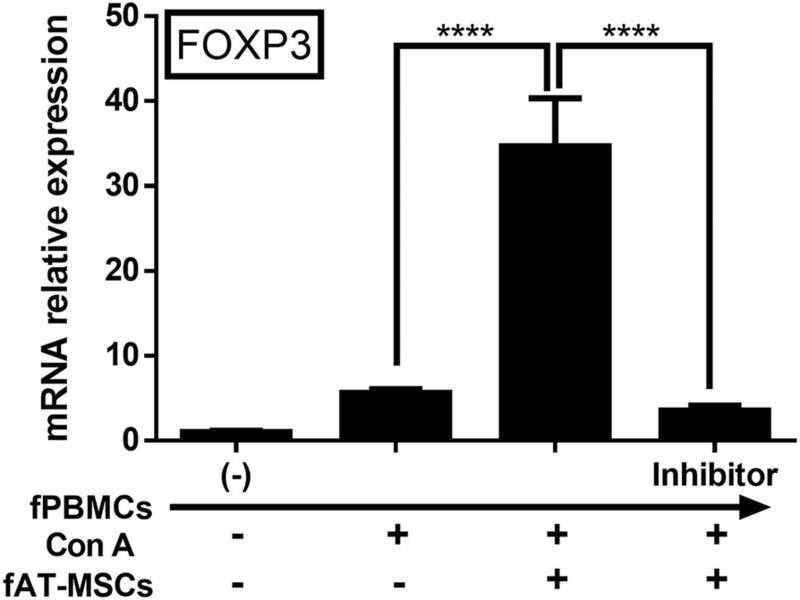 In addition, in vivo, fAT-MSCs blocked the infiltration of CD3+ T cells and increased the FOXP3+ Treg population in the injured colons of DSS-treated mice. These results suggested that the increased number of colonic Tregs in the fAT-MSC-treated group was associated with PGE2 secreted from fAT-MSCs. Although we could not rule out the possibility of the contribution of other factors secreted from fAT-MSCs to the FOXP3+ Treg proliferation in mice with colitis, our findings collectively suggested that fAT-MSCs inhibited inflammation by regulatory T cells via a paracrine mechanism and that PGE2 secreted by fAT-MSCs may play an important role in increasing Tregs in mice with DSS-induced colitis. PGE2 released by fAT-MSCs alleviated DSS-induced colitis in mice by inducing an increase in the Treg population. Our data indicated that regulation of PGE2 production modulated Treg development and function, thereby suggesting attractive therapeutic strategies, such as targeting PGE2-activated Tregs in the treatment of IBD. Taken together, our findings suggested that fAT-MSCs may be potential candidates for cell-based clinical therapy in cats with IBD. With the consent provided written of the owner, Adipose tissue was obtained from a healthy, adult, female, domestic short-haired cat (1-year-old, 5.5 kg) during ovariohysterectomy at Seoul National University Veterinary Medicine Teaching Hospital; MSCs were isolated as previously described . Briefly, the tissue sample was washed four times in Dulbecco’s PBS (PAN-Biotech, Aidenbach, Germany) with 1% penicillin-streptomycin (PS; PAN-Biotech), cut into small pieces, and digested for 1 h at 37 °C with collagenase type 1A (1 mg/mL; Sigma-Aldrich, St. Louis, MO, USA). The enzymatic activity was inhibited by Dulbecco’s modified Eagle’s medium (DMEM; PAN-Biotech) containing 20% fetal bovine serum (FBS; PAN-Biotech). Following centrifugation at 1200×g for 5 min, the pellet was filtered through a 70-μm Falcon cell strainer (Fisher Scientific, Pittsburgh, PA, USA) to remove debris; erythrocytes in the pellet were eliminated by adding 1 mL red blood cell (RBC) lysis buffer (Sigma-Aldrich), and the cell solution was incubated for 5 min at 25 °C. Pellets were resuspended in DMEM containing 20% FBS and 1% PS and transferred to 100-mm dishes at a density of 3000 cells/cm2. Transferred cells were incubated in DMEM containing 20% FBS at 37 °C in a humidified atmosphere of 5% CO2, and the medium was replaced every 2–3 days until the adhered cells showed a fibroblast-like morphology and reached 70–80% confluence. Thereafter, the cells were repeatedly subcultured under standard conditions. Cells were characterized by flow cytometry using antibodies against the following proteins: CD9, CD44 (GeneTex, CA, USA), CD34-phycoerythrin (PE), and CD45-fluorescein isothiocyanate (FITC; eBiosciences, San Diego, CA, USA). For CD9 and CD44, indirect immunofluorescence was performed using goat anti-mouse IgG-FITC and goat anti-rat IgG-PE (Santa Cruz Biotechnology, Santa Cruz, CA, USA), respectively [43, 59]. Characterization was conducted using FlowJo 7.6.5 software (TreeStar, Inc., Ashland, OR, USA). Cellular differentiation was evaluated using special kits (StemPro Adipogenesis Differentiation, StemPro Osteogenesis Differentiation, and StemPro Chondrogenesis Differentiation kits; Gibco/Life Technologies, Mulgrave, Australia) according to the manufacturer’s instructions, followed by Oil Red O staining, Alizarin red staining, and Alcian blue staining. Male C57BL/6 mice, aged 6–8 weeks, were purchased from Nara Biotech (Seoul, Korea). All experimental procedures involving animals were approved by the Institutional Animal Care and Use Committee of SNU (protocol no. SNU-171121-5), and all protocols were in accordance with approved guidelines. Environmental conditions were maintained at a constant temperature of 25 °C and humidity of 50% with a 12-h light/dark cycle. For environmental enrichment, 3–4 mice were raised in polycarbonate cages (W324 × D221.5 × H130 mm) containing clean bedding (shavings; Nara Biotech), cardboard boxes, and tunnels. All the mice were supplied with sterilized maintenance mouse food and fresh water ad libitum. The studies were conducted using 22 animals, and mice were randomly divided into three groups, each containing 6–8 mice (n = 6 naïve, n = 8 PBS, n = 8 fAT-MSC). At the start of the experiments, the health status of the mice was evaluated by weight, vitality, and defecation, and the experiments were carried out with mice with no abnormal symptoms. Colitis was induced by administration of 3% DSS (36–50 kDa; MP Biomedical, Solon, OH, USA) in drinking water ad libitum from day 0 to day 7. On day 1, the following procedure was performed: fAT-MSCs (2 × 106 cells in 200 μL PBS) or an equivalent PBS volume was injected intraperitoneally into the mice. During housing, animals were monitored once daily for health status. The mice were sacrificed on day 10, and colon tissues were collected for subsequent processing. On day 10 of the study, all the mice were humanely euthanized with injection of xylazine and inhalation of CO2. A completed ARRIVE guidelines checklist is included in Checklist S1. The severity of colitis was assessed by scoring the clinical disease activity, including body weight loss, stool consistency, rectal bleeding, and general activity (Table 1). The combined DAI ranged from 0 to 16. Colon segments were fixed in 10% formaldehyde for 48 h, and paraffin-embedded sections were prepared for hematoxylin and eosin (H&E) staining. Histological sections of distal colon were scored blindly by an independent researcher. And Histological scores were assessed as means ± standard deviations of the different groups of colon segments. The severity of symptoms was calculated by scoring tissue inflammation and tissue damage grade (Table 2). The combined histological score for severity of colitis ranged from 0 to 6. Blood samples were obtained from the jugular vein of two healthy adult cats with the consent provide written of the owners, and blood (5 mL each) was collected into sterile CPDA tubes. Feline blood was diluted with an equal volume of PBS and layered over Ficoll-Paque PLUS (GE Healthcare Life Sciences, Piscataway, NJ, USA) in a conical tube. After centrifugation at 780×g for 30 min, the buffy coat layer was carefully collected. The collected sample was resuspended with RBC lysis buffer and incubated at 25 °C for 5 min. After adding PBS, samples were centrifuged at 850×g for 10 min, washed, and centrifuged again; The fPBMCs were plated at a density of 1 × 106 cells/well in 6-well plates (SPL Life Science, Pocheon, Korea), resuspended in DMEM containing 20% FBS and 1% PS, and stimulated with 5 μg/mL Con A (Sigma-Aldrich) for 6 h before further experiments . Then, 2 × 105 fAT-MSCs were seeded onto 0.4-μm pore-sized Transwell inserts (SPL Life Science). Additionally, the PGE2 inhibitor NS-398 (5 μM; Enzo Life Science) was added to the medium in the inhibitor group. The appropriate dose of NS-398 in these experiments was determined based on a previous study on the effects of NS-398 in feline cells . After incubation for 48 h, total RNA and proteins were extracted from the PBMCs and fAT-MSCs following collection by scraping and 2 ml of the culture supernatant was collected for enzyme-linked immunosorbent assay (ELISA) for PGE2. For in vivo experiments, six colon tissues were collected from each group, and for in vitro experiments, five replicates each were analyzed for fPBMCs and fAT-MSCs for each group. Total RNA was extracted from homogenized colon tissue, fPBMCs, or fAT-MSCs using an Easy-BLUE Total RNA Extraction kit (Intron Biotechnology, Seongnam, Korea) according to the manufacturer’s instructions. Extracted RNA was converted into cDNA using LaboPass M-MuLV Reverse Transcriptase (Cosmo Genetech, Seoul, Korea) following the manufacturer’s instructions. Samples were analyzed in duplicate using 10 μL AMPIGENE qRT-PCR Green Mix Hi-RO with SYBR Green dye (Enzo Life Science, Lausen, Switzerland), 7.4 μL PCR-grade dH2O, 0.8 μL forward and reverse primers (Bionics, Seoul, Korea; Table 3), and 1 μL template cDNA. Cytokine mRNA levels were quantified by comparison with that of glyceraldehyde 3-phosphate dehydrogenase. Supernatants from fPBMCs and fAT-MSCs culture medium were obtained after 48 h of incubation and used for protein analysis. PGE2 secreted from fAT-MSCs in the conditioned medium was quantified using an ELISA kit (Enzo Life Science) according to the manufacturer’s instructions. Paraffin-embedded colon tissue sections were cut into 4-μm-thick sections. Sections were deparaffinized in xylene and rehydrated sequentially in 100, 95, and 80% ethanol solutions; antigen retrieval was carried out using 10 mM citrate buffer (Sigma-Aldrich). After washing, the sections were blocked with a blocking buffer containing 1% bovine serum albumin in PBST for 30 min. The sections were incubated overnight at 4 °C with antibodies against FOXP3 (1:50; Santa Cruz Biotechnology) or CD3 (1:50; Santa Cruz Biotechnology). After three washes, the slides were incubated with secondary antibody. The colon sections, stained with an antibody against either FOXP3 or CD3, were washed three times and incubated with fluorescein-conjugated secondary antibodies (1:200; Santa Cruz Biotechnology) or Texas red-conjugated secondary antibodies (1:200; Santa Cruz Biotechnology) for 1 h at room temperature in the dark. Colon sections, stained with antibodies against either FOXP3 or CD3, were washed three times and mounted in VECTASHIELD mounting medium containing 4′,6-diamidino-2-phenylindole (DAPI; Vector Laboratories, Burlingame, CA). The samples were observed using an EVOS FL microscope (Life Technologies, Darmstadt, Germany), and the immuno-reacted cells were counted in 20 random fields per group. Data are shown as the mean ± standard deviation. Mean values among different groups were compared by one-way analysis of variance using the GraphPad Prism 6.01 (GraphPad, Inc., La Jolla, CA). A P-value < 0.05 was considered statistically significant. This study was supported by the Research Institute for Veterinary Science, Seoul National University and Basic Science Research Program of the National Research Foundation of Korea. These funds contributed collect, analyze and interpret data for this study. JHA conceived and designed the study, collected, analyzed, and interpreted data, and helped in writing the manuscript; WJS participated in the conception and design of the study, data collection, and manuscript writing; QL contributed to the conception and design of the study, and helped with data collection; SMK, JIY, MOR and ARN collected the data; DHB and YCJ provided administrative support and study material; HYY contributed to the conception and design of the study, data analysis and interpretation, and granted final approval of the manuscript. All authors have read and approved the final manuscript. All Animal experimental procedures were approved by the Institutional Animal Care and Use Committee of SNU (protocol no. SNU-171121-5), Republic of Korea, and all protocols were in accordance with approved guidelines.